Assembling and installing IKEA kitchen cabinets is not for the weak of heart; it’s no wonder some contractors refuse to do it. 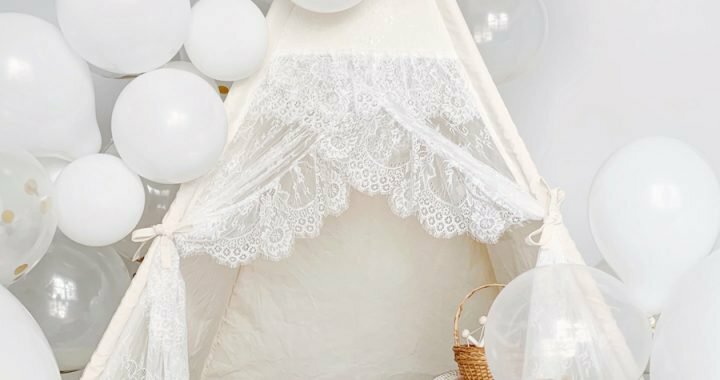 Today I’m sharing 15 DIY tips to help you get started! I will never forget the very first time the mister and I assembled IKEA furniture. Sure, it wasn’t anything fancy, but we had other priorities. So one evening, as we settled in for the final stretch of assembling the media cabinet, we heard a knock on the front door. Startled and without much thought we opened the door, hammer and knife still in hand. There stood our neighbor from downstairs, with an extremely annoyed look on his face which quickly changed to concern and borderline fear as his eyes landed on the tools in our hands. Talk about a first impression, right? I’ve heard horror stories of contractors refusing a project as soon as they realize the cabinets are from IKEA. Now, I understand why: It is not for the weak of heart. In fact, if you’ve been following the installation progress on Snapchat (FOXYOXIE), you’re well aware that it’s been WEEKS since we first started assembling the cabinets. Granted, we’re only able to work in the evenings and weekends, as both of us have corporate jobs during the day. Either way, assembling IKEA kitchen cabinets takes lots of time and a whole lot of patience. 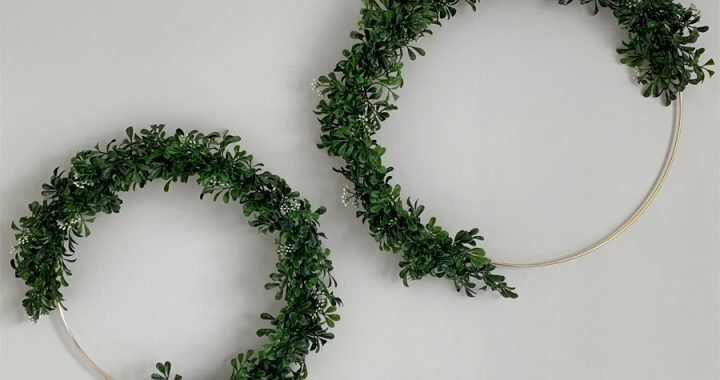 To help you get started, I’ve rounded up 14 helpful tips for those that decide to DIY. Tip No. 1: Turn on some music. Seriously, you will be spending hours upon hours reading through assembly instructions written in hieroglyphics; you may as well make this part of the process somewhat enjoyable with some upbeat tunes. Tip No. 2: Be prepared to use your own tools. If you’re expecting IKEA to provide tools for assembling like they do with some other furniture, you’re in for a surprise. For starters, make sure you have a screwdriver, drill and hammer. Tip No. 3: If hanging the cabinets on suspension rails, you’ll need to buy your own screws. Suspension rails are a better option than attaching the cabinets directly to the wall: It’s easier to keep the cabinets level when they’re on an already level suspension rail; plus, a suspension rail allows more flexibility; you can easily shift the cabinets to the right and left before attaching them together. Tip No. 4: Do not assemble the cabinets on the bare floor. IKEA cabinets are made from Medium-Density Fiberboard (“MDF”), also called “particle board.” Although it has its advantages like superior strength and warping resistance, particle board is easily prone to chips and scratches, so assemble the cabinets on top of an old blanket or dropcloth. Tip No. 5: The assembly process is fairly easy for one person to handle, but when it comes to installing suspension rails and hanging the cabinets, you will need a buddy to help. Not only are some of the bigger cabinets quite heavy for one person to lift, but certain parts of the process will require more than two hands. Tip No. 6: Follow the assembling sequence laid out in the installation guide. Even if you’ve already assembled five identical cabinets and think “you’ve got this” – refer to the instructions anyway. There will always be that one minor detail that you THINK you know how to install, and it won’t be until later (when it’s too late to change anything) that you realize you messed it up. Certain parts can be disassembled and re-assembled again, but not all. Tip No. 7: Know when to improvise. For example, when it comes to nailing the back of the cabinets, IKEA has a multi-page nailing sequence that goes something like this: Nail one nail in the top right corner, then in the bottom corner, then midway through the left side, then just a tad bit lower – you get the point. It’s stupid, and it’s pointless, and anyone with common sense knows to distribute the nails throughout so that the back of the cabinet is attached evenly. Tip No. 8: IKEA forums warn not to use drills when attaching screws, but unless you want to spend MONTHS on just the cabinet assembly, I say use the drill. Just don’t screw it in too tightly; use the drill to guide the screw almost all the way, but use a screwdriver to finish manually. The screwdriver gives you more control, so you don’t over-tighten the screws and cause the cabinet to crack. Tip No. 9: Double-check that the boards that slide into the back of the cabinet are facing the right direction. I cannot stress this point enough. The white side should be facing inside the cabinet, and the brown side should be facing outwards. Because IKEA installation guides are written in black and white, there’s really no mention of which side is supposed to face where. In the very first cabinet we assembled, we made the mistake of installing the brown side facing inward; now, we have to find matching paint just to paint the inside of the cabinet white. Remember how I said certain parts of the assembly are irreversible? Well, this is one of those parts. The board is then nailed into the cabinet using teeny-tiny nails, and there’s no way to pull them out once you’ve driven them inside. Tip No. 10: Start the installation with the corner cabinet, and work your way out. We started with the upper cabinets because at that time we were still having our hardwood floors refinished, which prevented us from installing any of the bottom ones. Besides, because upper cabinets are more shallow, it’s easier to get them out of the way so you’re not having to reach over the bottom cabinets to hang the upper ones. Tip No. 11: Hang the upper cabinets as high as you can to avoid having a soffit. IKEA offers two heights for the upper cabinetry: 30 and 40 inches, and I suggest opting for the 40-inch ones. Keep in mind that the distance between the lower and upper cabinets should be approximately 18-20 inches. 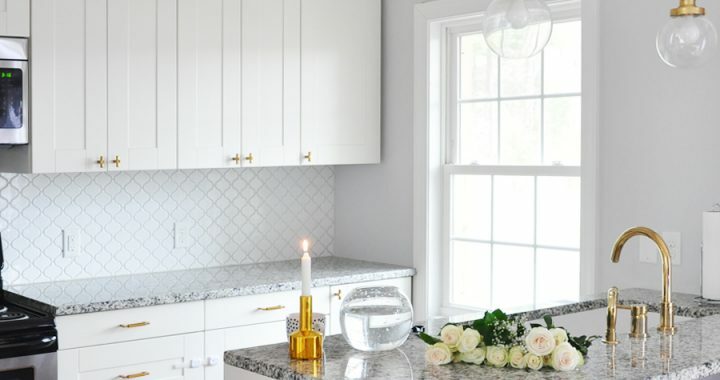 Countertop height is typically 36 inches, so add a 20-inch distance, plus 40-inch tall upper cabinets, and you’ve got 96 inches or 8 feet, which is the standard ceiling height. We have slightly higher ceiling – about 9 and a half feet – we no matter how hard I tried to eliminate the soffit, we will have to install filler pieces to extend the cabinets all the way to the ceiling. More on that later. Tip No. 12: This tidbit of wisdom should probably come at the beginning, but do your research. I learned far more reading about other bloggers’ and homeowners’ experiences than I did reading the official IKEA installation guides. Every time we would happen upon a dilemma or weren’t sure of the best way of doing something, I’d Google the question and happen upon yet another helpful blog. Some of my favorites are Pink Little Notebook (we’ll be building our peninsula thanks to Sabrina’s helpful tutorial), Chris Loves Julia (I’ve been a long-time reader of Julia’s blog and was over-the-moon excited to find out her kitchen is also from IKEA), and House Tweeking (Dana is an official IKEA brand ambassador who travels the country designing IKEA kitchens for the masses). Tip No. 13: Who writes an entire article on advice for buying IKEA kitchen cabinets, and then doesn’t follow it? Me! 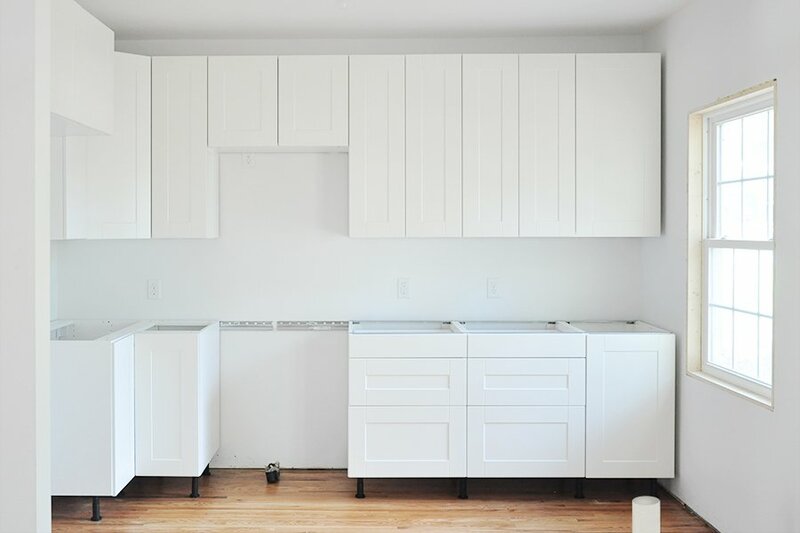 Despite warning readers to double- and triple-check the product inventory, we were quite far into the installation process when I finally mustered up the strength to do just that – only to find that I had ordered double the necessary doors and forgotten three of the upper cabinets. Off we went to IKEA, which, by the way, is about two and a half hours away. You live and you learn, right? Oh, how I wish.. Only four days have passed since our trip to IKEA, and I already know of several items we’ll need to return for. Moral of the story: Do a product inventory as soon as possible! Tip No. 14: Contrary to popular belief, the legs that come with IKEA’s bottom cabinetry are not meant for holding the cabinets up. Those little guys are plastic and will snap and chip the second a heavy weight is placed on them. (Trust me, I know!) Just like upper cabinets, bottom cabinets need to be hung on suspension rails. The legs’ entire purpose is so that you can easily attach the toe kick plate to them. When installing the bottom cabinets, screw in the legs all the way, hang the cabinet on the suspension rail, then unscrew each leg so that the cabinet is level. If your floors are uneven like ours, each leg height will be slightly different. Next on the list is to figure out the kitchen peninsula situation. Thanks to Sabrina’s helpful tutorial, we should have that up and done within the next week or so. I’ve also ordered a sample of some gorgeous brass cabinet hardware and am eagerly awaiting their arrival. 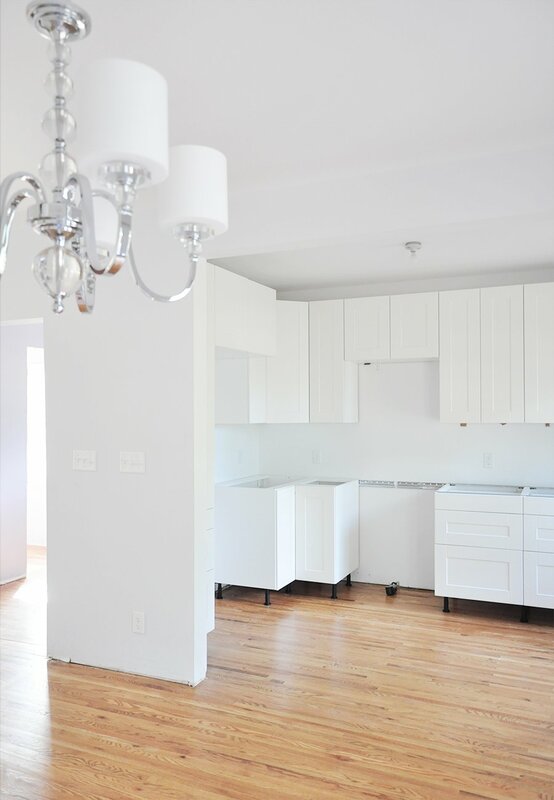 Then there’s the countertops, enclosing the soffit above the cabinets, installing filler pieces throughout… Phew, just typing out our to-do list is exhausting! I’ll be back oh-so-soon with more updates from the magical world of bungalow renovations, and in the meantime, please keep your fingers (and toes) crossed for us to make lots of progress over the next few weeks so we can (hopefully) move in some time in July, although it’s looking more like August at this point. To catch up on what we’ve renovated so far, you can browse “Our Bungalow Renovation” series. If you have any questions about designing, ordering, assembling and installing IKEA kitchen cabinets, feel free to ask. I know first-hand how nice it is to hear real-life experiences from fellow DIYers. Follow along with FOXYOXIE on Snapchat for behind the scenes! Posted in DIY PROJECTS, HOME DECOR, OUR BUNGALOW RENOVATION and tagged KITCHEN. Good article. I’m luckily only doing a small bar in the basement about 8′ long. One tip i’ve read from a lot of other blogs is that they build a base out of wood under the cabinets instead of using the legs’ I can see this being helpful for an island so you’re not concerned about the legs. Yes, that’s exactly what we did with our island. Feel free to browse http://FOXYOXIE.com/tag/kitchen for more photos of the finished space. And thanks for reading! Hi Anthony. We love how our peninsula turned out! You can see more of the kitchen by searching http://FOXYOXIE.com/tag/kitchen. It did not require any electrical work, as it only has the sink. Tip 14 is incorrect. The plastic Sektion legs are rated for 250lbs each. They can bear weight vertically, but they will snap instantly if you have weight on them at an angle (like when flipping a cabinet on its side). But when used correctly, those things will hold a mountain of weight. 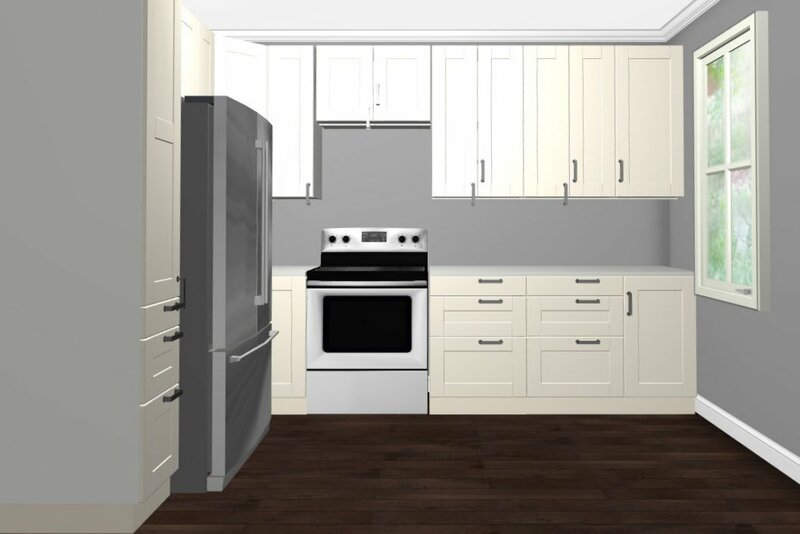 If you put your wall cabinets up as high as you could…..I’d like to have 20” between the bottom of the uppers and the countertop…how to you line the full length cabinets up since they are only 90” high (94.5 after installation)?……I would like the top of the cabinets to be at 96” but can’t figure out how to make that all look right with the full length cabinets. Thanks! Did you have any issues with the cabinets themselves not being square? If so, any tips for fixing that? Thanks!! Hi Kelsey! No, I don’t recall any issues with cabinets not being square… from what I remember, the IKEA instructions give a few suggestions for things you can do when things seem a bit misaligned – tips like tightening the screws in some places or loosening them a bit in others. The biggest issue we ran into was our walls and floor being a bit crooked because our home is so old (built in 1930). But you just make it work the best you can – you can always add details like trim and molding to cover any imperfections. I hope that answers your question! Tip 8+. Buy a drill with a clutch. Learn how to use it. If you set the clutch right, it is a wonder tool for getting screws in fast and not worrying about overtightening or stripping. Coupled with some hex bits it makes any IKEA assembly go a lot faster. We are thinking about a white IKEA kitchen. How long have you had yours and how does it hold up? I am curious about durability. Hi Lori! We’ve had ours for almost two years and haven’t had any issues with it. Question re: upper cabinet installation: top of cabinet his hung on the rail, that rail means there is a ‘gap’ between the backside of the cabinet and the wall, correct? Also, what about the lower horizontal edge of same cabinet, is there something to ‘space’ it out from the wall the same distance as the upper metal rail? 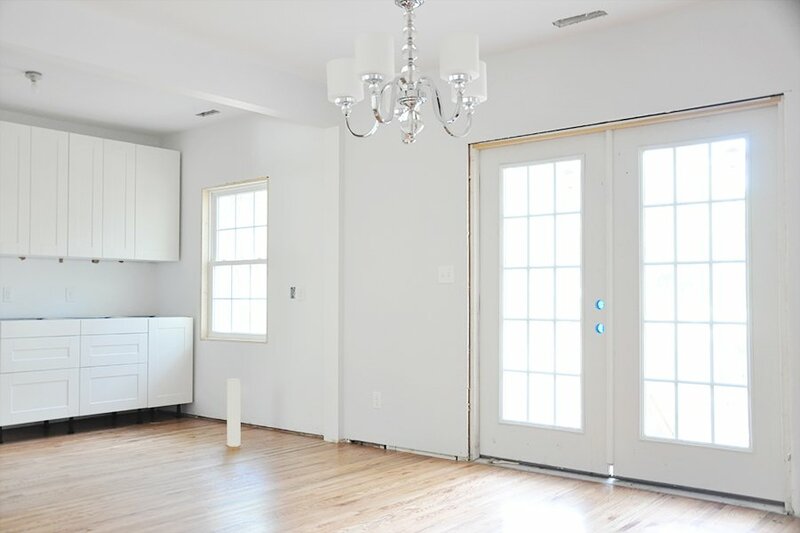 If not, then I assume the face (door) of the cabinets are not plumb, the cabinet’s doors/front face is sloping – comments? Bill, Hi, I have hung many. The bottom has a small “bumper” that you attach also, so yes the cabinet is off the wall about 1/8” top and bottom. I cant find the answer to this question anywhere . . .so I am hoping you have some insight but I am wondering if you can attach an IKEA door (front) so that it opens with the hinge on the opposite side from normal. I think if I don’t switch the position of the hinge on our corner wall cabinet it may not open due to the presence of the exhaust fan. Its been a while but if its a single door front you turn the door upside down it should fit (do not drill for the handle until after you install the door). Obviously this would not work for a double door system since there is no double door. Our floor drops about 1 1/2 inches from one end of the kitchen to the other. Any idea how much up and down adjustment can be made with the legs? After I hang the base cabinets I will be putting on the kick plate. Since I want the bottom of the kick plate to be flush with the floor, it looks like I will need to cut the kick plates so that the bottom of the kick plate matches the rate of drop of the floor. Have you had any experience with this, or know anyone who has? It seems like getting the angle correct may be difficult. The other problem I anticipate is that the kick plates on the side with the low end may not be tall enough to completely fill the space under the cabinet. P.S. I got a lot out of reading your blog. We had the same problem with the varying toe kick height. I solved it by cutting a new piece of plywood to the correct dimensions (with some trial and error) and attaching the plastic mounting brackets with small screws to the back side of the toe kick. I painted all our cabinets, so the toe kick was painted also. If you’re not painting yours, you could do what I did, then attach the pre-finished toe kick to the front of the plywood. If you have the difference at the top edge of the toe kick, it won’t be noticeable. Looks nice. 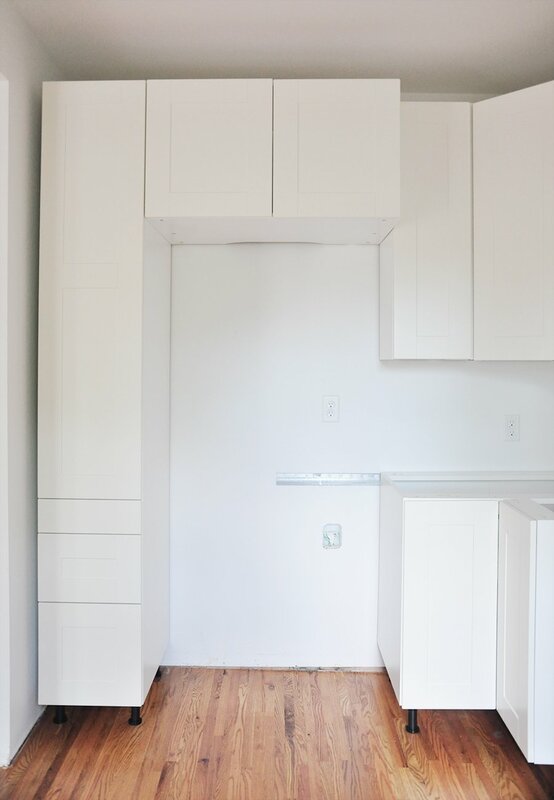 Quick question: What is the distance from the wall to the face of the door for the wall cabinets (including thickness of the suspension rail, cabinet, door thickness)? And do you have to slightly lift the cabinet to install it on the rail? Hi Xavier! I am not sure of the distance of the suspension rail to the back of the wall cabinet, but the other two measurements can be found on IKEA’s website, depending on what cabinets you order. And yes, you do have to lift the cabinets ever so slightly to hang them on the suspension rail. Good job on your kitchen. The only thing I would point out to your readers is following the first _three_ nail placement instructions is very important. The backs are made so that they slide in. There is an ⅛” of play in the back to allow for it to slide in. By ensuring it is tight in the bottom corner with a nail then the other bottom side then the top left side you are ensuring that you cabinet is square. Also on taller cabinets I use a straight edge (a suspension bar could be used) along the long side and put one nail in the middle of the span to be sure the sides aren’t bowed. Hi Oksana, very nice blog. We looking into buying several tall (90 Inch) IKEA cabinets to built the wall with the fridge in the middle. Do you have any tips on installing the handles? It doesn’t look like any of the doors and drawer fronts have any holes. How hard it is to drill those? Do they provide a guide? Hi Elena! Great question – we used a hardware installation template we found at Home Depot – one for the cabinet doors and another for the drawers. You can purchase both pieces here. Our drawers, unfortunately required additional measuring – but only because I wanted the pulls to be in the center of each drawer rather than at the top. Since you’re installing wall cabinets only, you won’t have to deal with that. The drilling and installation itself was a breeze once you’ve measured and marked where the knobs should go. Hope that helps! Let me know if I can answer any additional questions! Nice, and job well done! I was looking at the IKEA guide, and it shows that the top suspension rail for the wall cabinets needs to be hung at 82 and 3/16″ from the floor, but I am assuming this is for the 30′ wall cabinets. Did you instead have to add 10″ and install the railing at 92 and 3/16″ for your 40″ cabinets? Very nice tutorial. Do you have any tips for installing side “fillers” to close the gap between cabinet and wall? Hi Joel, unfortunately we haven’t gotten around to installing those just yet, but once we do, I’ll be sure to share our experience on the blog! Wow! It looks beautiful! Great job! Thanks for the tips – it really helped with our renovation. We recently put an IKEA kitchen in our rental property and I really love it! Putting together cabinets sounds really difficult to me. I like that you pointed out that IKEA says not to use drills to attach things. I would be really worried that I didn’t put the thing together right and it would collapse on me. It seems best to hire a professional to do the install for you. Hi Emily! Thanks for reading and sharing your thoughts. The process was very easy, actually – just time-consuming. 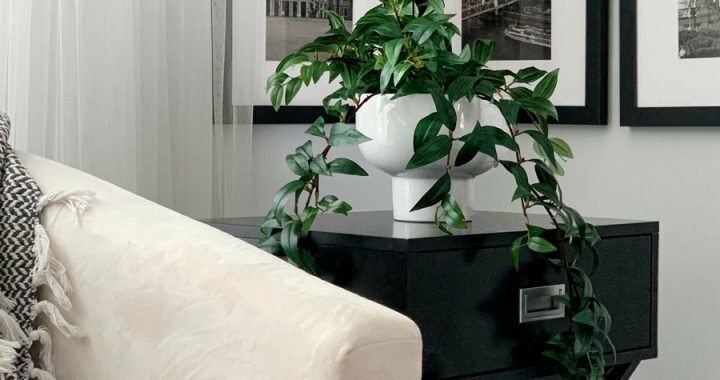 As far as IKEA cabinets are concerned, they’re designed in a way that even DIY novices with basic tools can assemble and install them, but I understand that DIY projects aren’t everyone’s cup of tea. 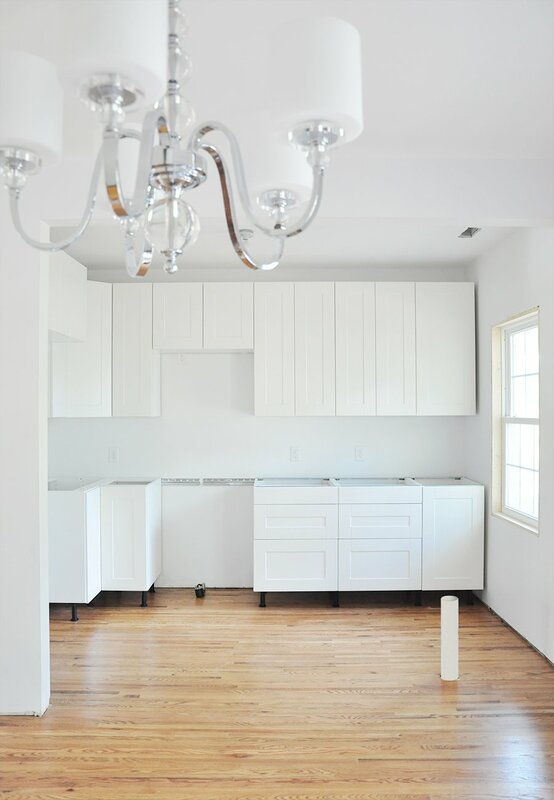 We were able to save thousands of dollars by doing much of our house renovation ourselves – and it came out far better than many of the projects that we hired out, so in the end it was all very worth it. You can see the completed kitchen here and here. I love reading about your renovation! It looks so good! Wow your kitchen is gorgeous! I love crisp, clean, white kitchens! These are great tips! You did an amazing job! Wow you did an awesome job! I loooove IKEA and these look great! This is a super helpful post! I’ll keep it in mind if I ever get IKEA cabinets! Your kitchen is going to look lovely!! Wow such an intense project but the results are beautiful! Ikea furniture! So good but so ridiculous to build! My husband spent a full weekend building a few pieces we got last year, but in the end…so worth it! I absolutely love your kitchen. It is coming together beautifully. These are amazing tips. Definitely going to bookmark for future Ikea furniture building! Wow everything is looking pretty good so far. I have a love/hate relationship with building IKEA furniture. We are actually looking to remodel our kitchen soon and will be making a trip to Ikea soon. Thanks for these tips! Those cabinets look awesome! Good job! Love Ikea!